I decided to snap a couple of other things at the wedding we attended recently, on Aug 27th….will be posting them…. After they have played on all the requisite occasions at the weddings (at important junctures, the thavil players alone play hard and loud, which is called “getti mELam”…to draw the audience’s attention to the rite going on) they are honoured and paid by the (who else?) bride’s father, and feasted and sent on their way…to the next engagement! It is difficult for nAgaswaram players to make ends meet,even if they are attached to a temple. In this picture, the players put down their nAgaswaram thinking they were posing…I kept requesting them to play but they politely waited for me to finish clicking! One player has the nAgaswaram acoss his lap. The young “katthukkutti” (the learner) who plays the pitch and keeps the beat is sitting on the chair behind the dais. One thavil player has gone somewhere; the caps on the other player’s fingers can be seen. Traditionally, the players would be wearing “veshtis” and just an upper body cloth…it is a recent trend to wear kurtas, shirts or khadi (homespun) tops. They normally wear rings on all their fingers so that the gold and stones can glitter as they play, and used to wear thick gold chains on their muscular chests. When someone wears too many rings, s/he is ridiculed, “why are you looking like a nAyanakkAran?” (nAyanam is a Tamizh synonym for nAgaswaram.) So, if a Tambram uncle complains of today’s pop idols with flashy jewellery…remind him about these players! On the right hand side is a niche with a silver embossed icon of Ganesha, with a lamp lit near it. Chairs meant for seating the guests at the wedding are stacked on the left hand side. 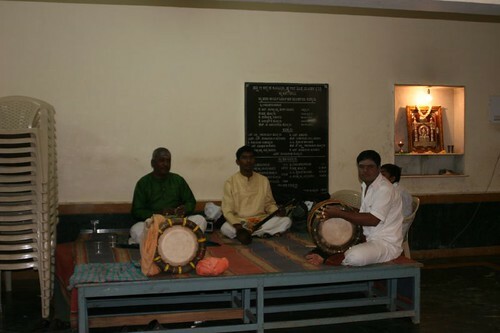 Though Carnatic music is thought of as a preserve of the Brahmin caste, this is really not so…almost all nAgaswaram players belong to the “Pillai” community and in the villages, everyone flocks to hear their recitals.Recently, instruments like the clarinet or the saxophone have also been successfully used. Students of Carnatic vocal music are traditonally told to listen to a lot of nAgaswaram music as it is the wind instrument closest to the human voice, and renditions on it can easily be emulated by the vocal student. What a sight it is to see the nAgaswaram players swaying to their own music and walking along in front of a procession of a God from a temple! The sound of a nAgaswaram is an instant association with festivity….whether religious or social. I enjoyed writing all that! After spending time reading non-fiction, I suddenly developed a yen to revisit the stories of my childhood…and I have been re-visiting them. And I find that some of them are evergreen and provide me just as much joy as they did then…. Then there’s P G Wodehouse….”Plum” and Dame Agatha were mutual admirers and actually referred to each other in their stories! His light-as-air comedies are so easy to read and so difficult to write… I realized on my first trip to London, that he had used many of the station names in and around Kent and Surrey, as names for his characters. Enid Blyton is another favourite, recently reviled, that I will be visiting… I didn’t do much Noddy or the Secret Seven, but the Famous Five, the Find-Outers, and the O’Sullivan twins, the Mallory Towers series, and the various mysteries…how I loved them as a child! Isaac Asimov is another writer which one can read at any age…What a gigantic intellect, combined with a sense of fun…he must have been a wonderful person or a crusty codger, depending on one’s point of view! I remember a line from “Authorised Murder”, in which he put himself in as a character: “He was so secure in his own intelligence that he never bothered to show it.”…or something to that effect. Single books that I have loved? “To Kill a Mockingbird” by Harper Lee…”That Little Limb” by some unknown author which must have been the first book I ever read. Alice in Wonderland ( one of the books of which the animated movie by Disney is really WONDERFUL)…the Jungle Book and Just So Stories…oh my, this list isn’t going to end..I have not even touched on my favourite books in my mother tongue, or the other languages (I have known 4 languages fluently from my earliest remembrance.) will have to post again…Ponniyin Selvan, Thakurmar Jhuli, Yashodhara…. I have been struggling to learn more than the rudimentary Kannada I know, but sadly, it is not needed at all in daily life, and my efforts are still mostly in vain. I made sure I learnt the alphabet as soon as I moved into this city. I watch Kannada films or sometimes, TV serials, to enable my understanding of the spoken language. But I must say that Kannada (or other Indian languages) are not taught well, the way foreign languages like French and German are (I learnt German so well in this very city.) An antiquated, didactic approach prevails. Foreign language classes are made great fun to attend. There is stress on hearing and speaking as well as reading and writing. Audio-visual material is shown regularly. I would love to have either a converstaional Kannada course in my locality or to attend a really well-designed Kannada basic course. I still go and watch Girish Karnad’s plays first in English and then in Kannada to understand a little of the original flavour. I go to attend Yakshagana or puppet performances. Since I grew up in a region far away from where I orginally hail from, I know the enrichment that comes from exposure to a different culture. I would love it if learning Kannada were made easier…there must be many,many people like me who would like it too.The Karnataka govt should run well-designed, conversation- and everyday situation-oriented basic Kannada courses, and have them in all areas…if there is a course running in Rajaji Nagar, there is not much chance that I, from J P Nagar, will be able to attend regularly! You want some beautiful abstracts taken during the Ganesha festival? woot, as these youngsters would say…! have you met these people? Inspired by something latelyontime said…. I love to meet the ladies and gentlemen who are “instant authorities” on other countries, which they have visited for a few days. When someone who has lived in a country for a few years comes along, they immediately give that person a lot of information about the geography, history, customs and practices of the place….ask if s/he has visited “A”, “B” or “C” town/ places of tourist interest; when the resident says, “No,” politely, the response is, “But you MUST go there! How can you live there and not have visited that place?” Not for them the idea that different people might have different agendas in another place; everyone must do, see and experience what they did in the two or so days that they spent there….and they seem to have been everywhere and done everything, in the 3 days that they spent there, probably 15 years ago….. They will talk with great knowledge about what the people there do and how they behave and what they think…. I find that it’s the people who have travelled the most and visited the most countries who generally keep perfectly quiet about their travels and their observations! Closely allied to this IAT (instant authority tourist) is the IRR (instant relative recollector.) This person, on hearing of, say, someone’s living in Kalamazoo, Mi ( I actually DO know someone who lives there btw, right zweilinkefusse?) they say, “Oh, you are living in the US? My sister’s brother-in-law’s nephew also lives there, I think it’s some place like Oregon, maybe you have met him?” This breed, however, is vanishing these days…after the advent of IT, every second Subramaniam and Krishnamurthy’s son is in the US, so they are now more aware of the vastness of US geography, and less prone to this “If you are in Florida you must meet my relative in California” conversation! Sometimes, even as I am writing something, I think of someone specific reading it and wonder what the reaction will be…for example when I post descriptions about my home and surroundings, I think of how asakiyume or suzan_s will react….but the amazing thing is that I never fail to be surprised at where reactions come from, and what they are. Who would imagine that siniak_castle would be interested the floriculture of Bangalore? That thaths would respond about Kannadasan? Or that wondernoon, who was a child when I was a young woman, would express much the same thoughts and feelings that I had when my child was the same age as hers is now? I look forward eagerly to the comments, and often, they provide points of view and perspectives that really open up my thinking into new vistas…I like compliments and savour them, but disagreement, too, can be such a stimulus! Well…here are a few pics that I took at Gandhi Bazar, one of the large market areas in Bangalore, today. But first,my disclaimer…. Apparently the camera was set for indoor shots (we were going to attend a wedding) and since I decided on the spur of the minute that I would take pictures, KM had no time to re-adjust KMC (KM’s camera). And of course, I was in a rush and didn’t aim too well either. So please excuse the general technical terribleness of the shots and just see the scenes! I took a lot of pictures of flowers this time, because Bangalore is known as a floriculture centre, and is known for the wide variety of flowers on sale here. 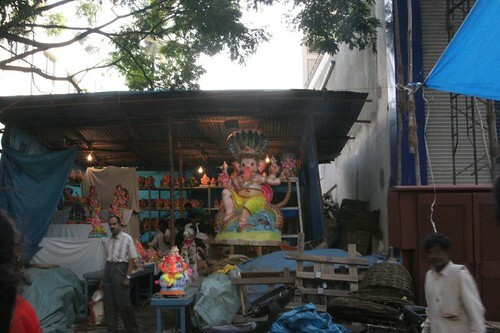 Here’s a shop selling different sizes and representations of Ganesha…. I am sure many of us know people like this and each of us might think of a different community! And, of course, there are the exceptions that prove the rule..the really nice, kind-hearted, helpful and good-natured people who bloom like lotuses in the muddy ponds! Learning many things at once… and met …. Learning a lot of different things at once can be daunting sometimes…..
Getting sanathreddy‘s first picture on to Flickr, and then to LJ, proved a challenge for me as I didn’t realize that Nikon raw was in a different file format from Canon raw…one assumes standardization! So amoghavarsha came to our aid, in the middle of a VERY busy day! Today, we were passing through Bangalore’s lovely Gandhi Bazaar at its festive best (today is Ganesha Chathurthi, or fourth phase of the moon which is the festival of Ganesha) on our way to a wedding, and I felt I *had* to take some snaps (couldn’t get to 9th Block yesterday) ….and I got off with KMC (KM’s Camera) while the poor spouse, muttering to himself, parked a little way ahead. I clicked some pictures…and the colours seemed not very bright. KM explained that he had set the camera for indoor shots and told me, “It’s a complicated camera.” As if he had to tell me that! Well, I will post those tomorrow, as we just came home to wish someone else a happy wedding anniversary, and are back to the friend’s wedding again…I will post some shots from the wedding, too…. KM won’t tell me where the camera manual is…that is one way I could learn more about it…. But one of the nice things about the wedding today was meeting usha123, who recognized me from my photos and came up to say hi! Wanted KM to take a snap of both of us, but in the rush of the wedding rituals and work to be done, it didn’t happen…usha123 travels all over the world on her work, must get her to post more often! Wanted to post this earlier…but things kept happening, particularly, getting sanathreddy on to LJ happened….and today was really busy. Since kadambarid had come over to attend a conference, I thought she might like to see Ranga Shankara, so met her there. A bright, enquiring mind…I will enjoy spending time with her at any time! The set of plays, called “Final Touches” at Ranga Shankara , by Yours Truly Theatre, turned out to be 4 one-act plays where the audience reaction would determine the ending. Each play was supposed to be in a different language. We watched the “Kannada” one ( inverted commas because there was a large smattering of English), “The Purple Rose”, and then the “English” one, “ctrl/alt/del” (inverted commas because at one point of time we thought we were already into the Hindi one! )…the group acting this one was actually pretty good….they are beginning to get their comic timing right. Well-meant plays, but…and it was a pretty big but….the first two plays overran the time stated so very badly. I agree that it will take a little time for fresh theatre groups to work off their amateurishness…but they must estimate their time correctly, especially if audience responses are going to be there, too. At the end of 2 hours, only 2 plays had been done…we could not stay beyond 9.30pm as sanathreddy and I decided that it was important to put kadambarid into an auto and send her safely off to Malleswaram.. so we left. Luckily, kadambarid‘s conference was just down the road from where I live, so she was able to come over again the next day, and we spent a little time together, discussing assorted subjects such as atheism, her family, and communism vs capitalism….Had to go for my swim while she was here ( if I postpone the time I often wind up not going at all, lazy bum!) but she didn’t seem to mind at all! You are currently browsing the Deponti to the world blog archives for August, 2006.